Brush off the dirt and make a clean sweep as you embark on a career to become an accomplished street cleaner. Use your highly detailed sweeping machines to roam the city in search of muck. As your experience grows so will the tasks you have to deal with! Get swept up into fighting the flotsam and jetsam of city life with Street Cleaning Simulator! 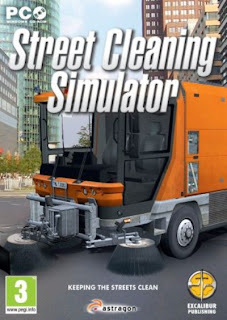 In Street Cleaning Simulator you are the proud owner of a small firm specialising in keeping the towns roads free from all the leaves and dirt that accumulate over time. Visit your office to learn what work the Mayors office has for you. Your vehicle is a highly sophisticated street cleaning machine. Its equipped with three high powered and independently operated brushes. Whose work is supported by highly powered water jets which are needed to remove that stubborn street dirt. Youll be operating on busy streets so youll have to use your driving skills to avoid pedestrians and other road users. highly detailed vehicles and a wonderfully crafted town for you to explore and keep clean! 3. Mount, or be stupid and burn the .ISO. 4. Install it, no keys/anything needed.